For the purpose of the Legacy Update, the area covered by this chapter includes the land beyond Winston-Salem’s Downtown but still in the “Serviceable Area,” or that area of the county which can be served by gravity sewer. This includes: GMA 2, Urban Neighborhoods; GMA 3, Suburban Neighborhoods; GMA 4, Future Growth Area, as well as the small municipalities in Forsyth County. This chapter covers the problems, issues and development challenges that each one these areas have as well as the concept of Activity Centers and Corridors. The Future Growth Area, which currently does not have public sewer, is included in discussion on suburban neighborhoods since this area is considered suburban once services are provided. Chapter 3 of this document, Growth Management, discusses development considerations for each of the GMAs. For GMA 2, Urban Neighborhoods, goals include promoting housing options for older adults, bringing housing up to code, revitalizing older strip development, reuse of older industrial structures, expansion of the RUCA program, identifying Growth Corridors for quality infill, preserving historic resources, controlling and reducing crime, encouraging alternative transportation, modernizing public transit, retrofitting small parks and greenways into neighborhoods, and improving older parks. In GMA 3, Suburban Neighborhoods, goals include encouraging mixed-use development, connectivity, increased density at Activity Centers and Growth Corridors, limiting strip commercial, retrofitting aging shopping centers, creating an industrial land preservation program, building open space into residential developments, constructing additional sidewalks, retrofitting roads to meet traffic demands (including bike lanes), creating new parks and greenways and extending transit as appropriate. In GMA 4, Future Growth Area, goals include working with schools to build in areas that can best be served with infrastructure, providing services in an orderly fashion, developing appropriate commercial at select nodes, and creating an industrial land preservation program, Chapter 3 also discusses the concept of Activity Centers and Growth Corridors. 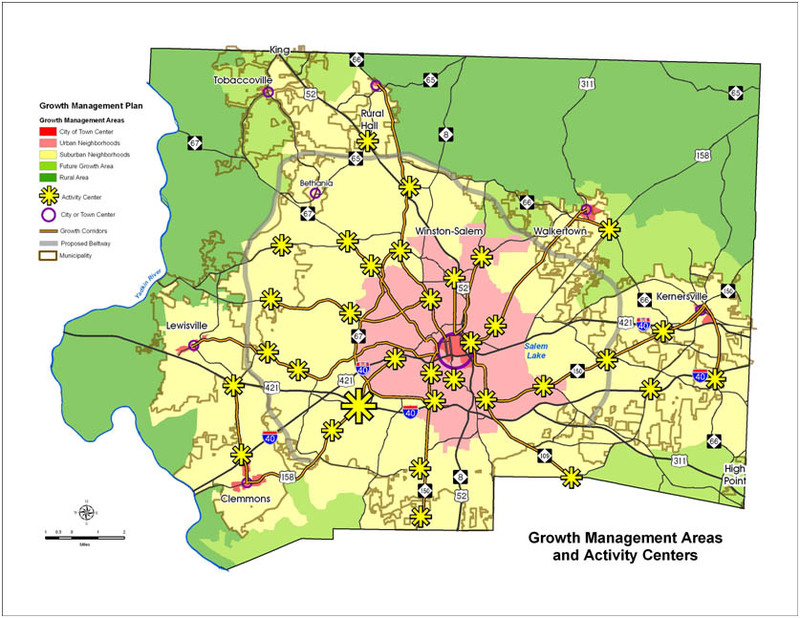 Activity Centers are compact areas that have a mixture of uses and higher-density housing, are walkable and transit-oriented, and have a “sense of place.” Two types of Growth Corridors are recommended: Primary Corridors link Activity Centers to Downtown Winston-Salem while Secondary Corridors are major roadways linking Activity Centers to one another in suburban neighborhoods or to smaller municipalities.